THE BATS WERE in a frenzy. 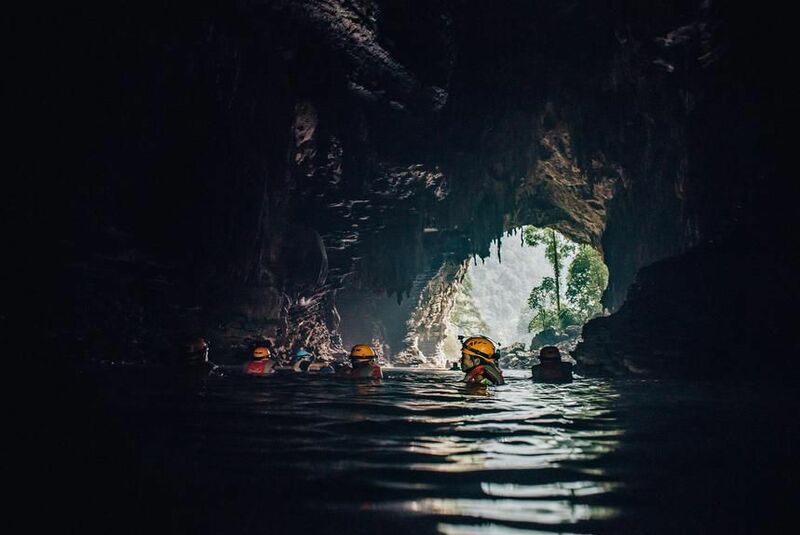 At first it was just a single creature, flashing past my face as seven of us, wearing life jackets, helmets and headlamps, bobbed in a shadowy river inside a 3-million-year-old cave in north-central Vietnam. As we swam deeper into the darkness, into a watery chamber the size of a basketball arena, our beams revealed scores of bats zipping around us from all directions, feasting on constellations of tiny white bugs orbiting our illuminated heads. Cave swimming isn’t for everyone. I was halfway into a three-day hiking and swimming tour in what is fast becoming one of the world’s most popular caving destinations, a massive limestone formation 300 miles south of Hanoi. Hundreds of caves are carved out of an otherworldly landscape of undulating mountain ranges and isolated karst towers that feels so prehistoric you half expect pterodactyls to come swooping through. 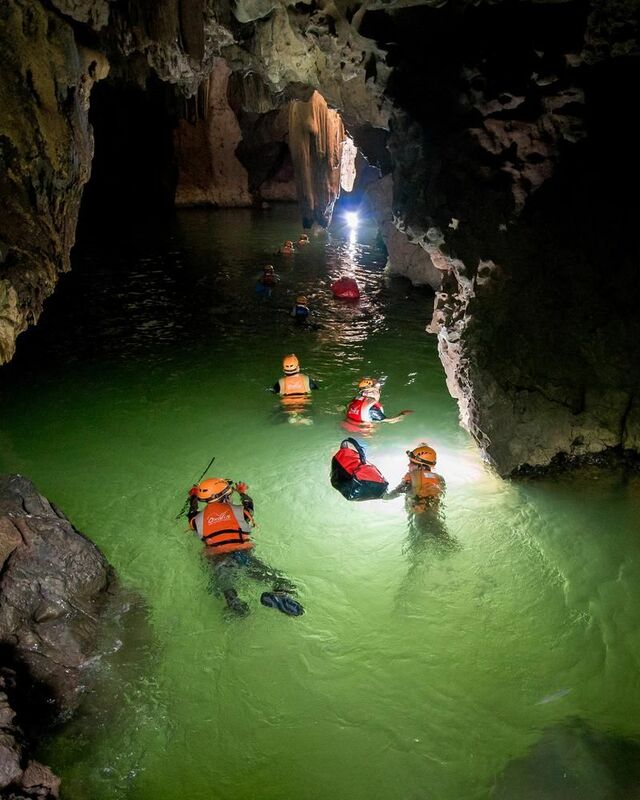 Southeast Asia’s tourist-friendly bounty of caves entered the spotlight last summer, when heavy rain flooded the subterranean chambers that 12 young Thai soccer players and their coach were exploring post-practice, trapping them. Our expedition, run by Oxalis Adventure Tours, was painstakingly laid out by speleologists with extensive experience mapping caves and led by guides trained in first aid and water rescues. Most important, we weren’t in danger of surging waters because Oxalis doesn’t run tours in the rainy season. Cave tourism in Vietnam is a relatively recent phenomenon. British spelunkers started surveying the region in 1990 and discovered the largest known cave passage in the world, Son Doong, in 2009. It’s nearly 4 miles long and tall enough to contain a 40-story building. Oxalis, formed in 2011, started the first trekking and camping expeditions in that cave and several others. Even after the Thai incident, business is thriving for Oxalis and other local cave operators, they say. I opted for the tour with the most swimming, Oxalis’ Wild Tu Lan Cave Explorer. Our trip began in Phong Nha, a small town on the Son River surrounded by jagged ranges and populated by low-slung hotels and homestays run by locals capitalizing on the growing tourism. After a 90-minute drive northwest to Oxalis’ staging base, our tour guide, Pham Hong Dai, briefed my group, which included three Californians, a banker from Milan and a college student from Da Nang. He told us what was in store: six caves, 10 miles of hiking, 1,000 yards of swimming in four caverns, and two nights camping at waterfalls outside caves. And he offered some crucial bits of advice: Watch for poison ivy and snakes and don’t overtake him. Oxalis provided the caving gear, and porters carried our bags ahead to the first campsite. In the 90-degree heat and humidity, we walked from the Oxalis pavilion onto a concrete road built by the makers of “Kong: Skull Island,” filmed in the province in 2016, through a valley hemmed by lush peaks. We started with a hike up a mountainside to a dry chamber called Rat Cave, a lair for the movie monster and our setting for lunch. The opening of this dry cave was like a giant shark’s mouth with serrated teeth at the top. Inside, an obelisk-like stalagmite stood sentinel atop a mound decked with moss and neon-green ferns. After lunching on pork spring rolls and dragon fruit spread out on a tarp, we ventured into our first darkened chamber, headlamps exposing thousands of ashen stalactites clinging to the ceiling 50-feet above like icicles coated in cobwebs. Every cave featured both tight passages and massive chambers, some as high as 150 feet, often streaked in blues, greens, grays or yellows derived from trace minerals and organic acids. Most of the rooms were encrusted with formations bulging from the walls, dripping from the ceilings and rising from the floor. Recurring shapes reminded me of Doric columns, mushroom clouds and giant squids. After leaving Rat Cave, we hiked two hours down the mountain to our first campsite and our first swim, outside of Ken Cave. There, a one-story waterfall tumbled from the entrance forming our own private swimming hole. I walked straight into the warm emerald pool in pants and shirt before shedding them for a few laps, enamored of the white cliffs encircling the swimming hole. The light dimmed as I swam butterfly 75 meters into the back of the cave’s mouth. Thoughts of a Leviathan dragging me under sent me quickly in reverse, swimming backstroke under massive stalactites hanging two stories above like divebombing dragons. That night, at the campsite, we toasted our adventure with rice-wine shots. In our tents at 8 p.m., we fell asleep to the sounds of screeching insects and crashing water. The second day brought swims in three caves. First we were back in Ken, in our shirts, pants, boots, life jackets and helmets, pulling against the slight current. After 150 yards, we climbed out onto a ledge, slowly moving over muddy paths, dry sandy floors and spiky rocks. We came to a 2-foot high stalagmite like a baptismal font. “Lights off,” Dai said. We sat on cool clay, listening to drops splashing every few seconds into the round font, leaving behind micro-traces of minerals that form dripstone over millennia. We ended the afternoon by hiking into nearby Kim Cave and into a shallow river. We trekked knee-deep before coming to a small series of rapids, our first waterfall in the dark. On the third day, we entered our final cave, Ton. We swam through narrow passages that resembled canyon gorges, a few feet wide and 30 feet high, against the strongest current of the trip. “I thought you were going to pick an easy one for the end,” said Carlos Morales, one of the Californians, to Dai as we trudged out of the watery entrance. A quartet of white butterflies fluttered toward a path leading to an hour-long hike down to the valley, to showers and cold beer. Getting There: Vietnam’s most popular caves are in mountainous Quang Binh Province. As a base, most tourists use the town of Phong Nha, about an hour drive from the nearest airport, Dong Hoi, which can be reached via multiple daily flights from Ho Chi Minh City and Hanoi (baolau.com). From Da Nang, you can also take a picturesque, six-hour train ride along coastal cliffs north to Dong Hoi. Caving There: International speleologists attribute Vietnam’s outstanding caves to the abundance of thick limestone and warm water. Heavy rains in the fall mean the best caving months are February through August, and swimming is ideal in late summer when river temperatures are around 80 degrees. You can spend a few hours or a few days in the caves in and around Phong Nha-Ke Bang National Park, a UNESCO World Heritage site. Paradise and Phong Nha caves are mammoth, so-called show caves where thousands of visitors descend daily to tour from walkways or boats. Multiple-day tours are run by three companies—Oxalis Adventure Tours, Jungle Boss and Greenland Tours—each with government concessions to operate in separate caves. The tours are small, generally two to 16 customers, and operators provide van rides, caving gear and meals. 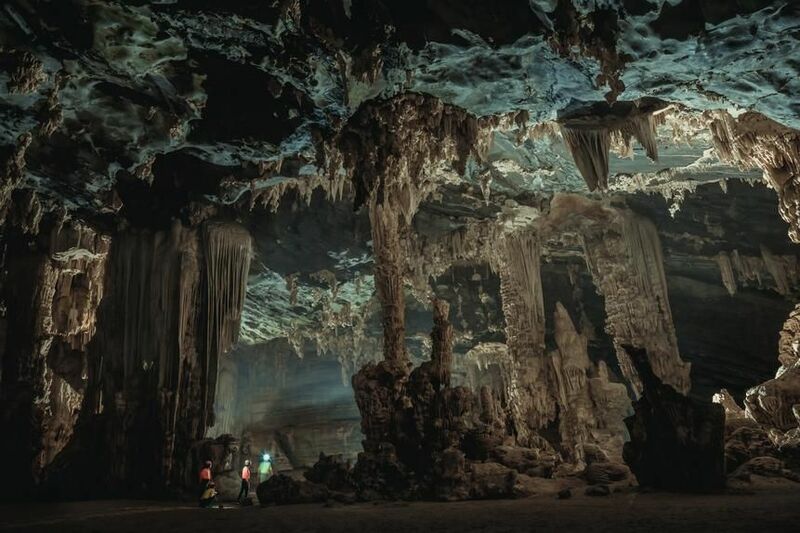 Oxalis offers 11 tours ranging from one day in Nuoc Nut Cave for about $70 to four days in Son Doong, with guests camping inside the world’s largest known cave passage, for $3,000 per person. The best swimming is on the Wild Tu Lan Cave Explorer, with two nights jungle camping, for $350. 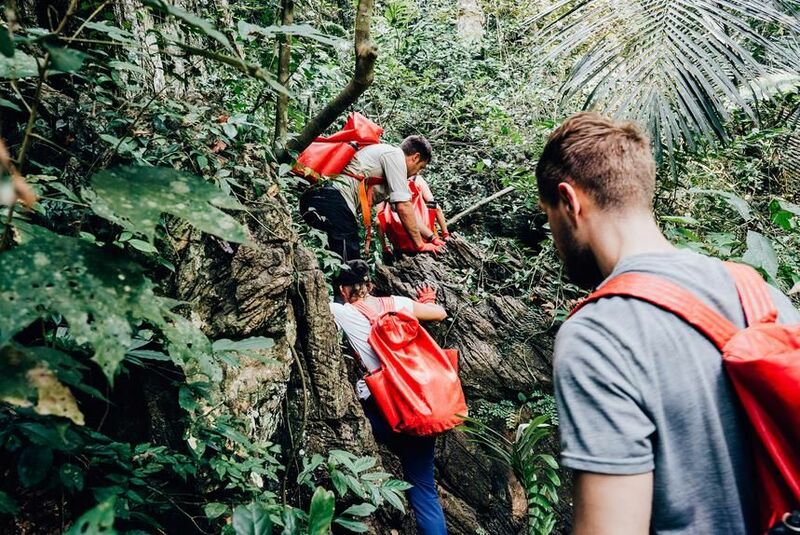 There is no cellphone service or electricity in the jungle so bring a power pack for charging. Staying There: Rooms in the growing number of guest houses along Phong Nha’s main road range from $15 to $30 a night. One of the few luxury offerings, Victory Road Villas opened in 2017 on the bank of the Son River with seven apartments in a fusion of French colonial and Vietnamese styles (from $150 a night; victoryroadvillas.com). Oxalis also runs Chay Lap Farmstay, a landscaped retreat with 39 rooms and cottages and a water sports complex on the river, where you can kayak and swim; it’s about a 20-minute drive from Phong Nha town (from $55 a night; chaylapfarmstay.com). Nguyen Shack Phong Nha Lake Hill opened this summer with 20 wooden bungalows in the countryside with a swimming pool shaped like a boat (from $35 a night; nguyenshack.com/phongnha/ecoresort/). ← Should Tourists Ride Elephants in Thailand?